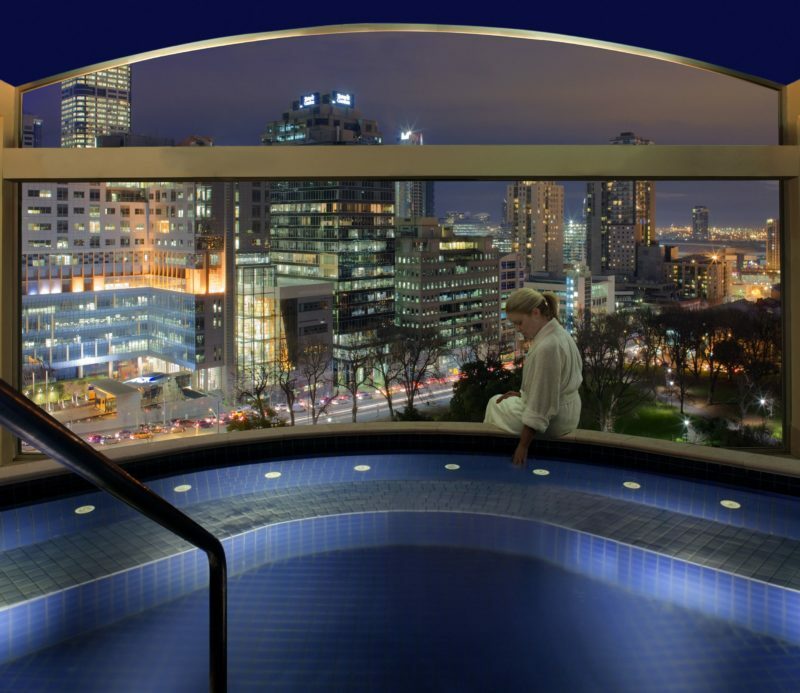 Treat yourself to a rewarding stay at the 4.5-star-rated Radisson Hotel on Flagstaff Gardens, located in the heart of Australia’s dynamic cultural capital, Melbourne. This impressive building once served as the Victorian Police Headquarters and now offers the perfect blend of historic significance and sophisticated luxury. 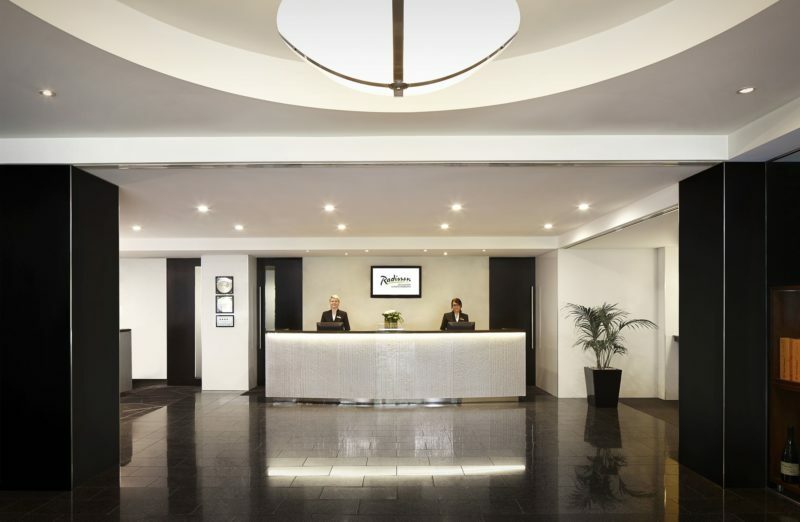 To ensure your stay is nothing less than exceptional, this Radisson Melbourne hotel offers 184 contemporary hotel rooms as well as numerous conveniences like complimentary Wi-Fi internet, a gymnasium, a business centre, conference facilities and fresh, locally sourced dining at HQ’s on William Restaurant. 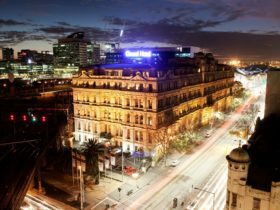 The hotel’s central location in the Melbourne CBD is just across from Flagstaff Gardens, the city’s oldest park, and next to the vibrant Queen Victoria Market. 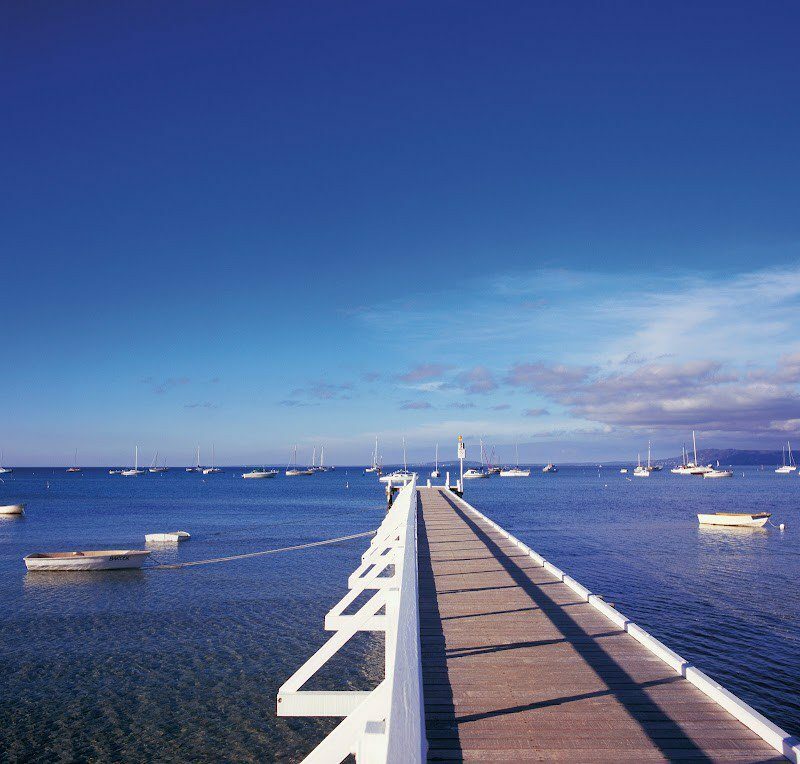 Off-site activities are just moments away-hop on the Free City Tram to the Melbourne Docklands precinct, laneway cafes, many fashion boutiques and trendy bars of the city centre. 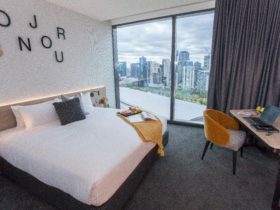 Relax and unwind at Radisson on Flagstaff Gardens in a contemporary Guest Room that has all the essentials, a Queen Sealy posturepedic bed, complimentary Internet, movies on demand with 24 hour room service so you wont have to leave the room. The Guest Rooms are located on the lower floors, offering a Queen Sealy posturepedic bed, 23 square metres of space, a 40” LED television, a large work desk, ergonomic business chair, tea and coffee-making facilities, movies on demand, complimentary Wi-Fi, a laptop-sized safe, minibar, pillow menu and complimentary bottled water. 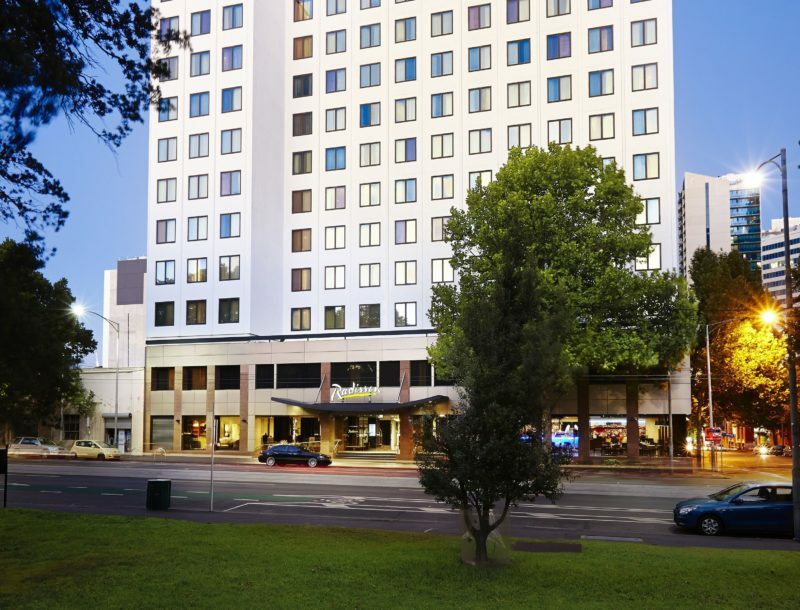 Enjoy a sleepover at Radisson on Flagstaff Gardens. Get a great nights sleep in one of the Superior King rooms that are contemporary by design and spacious in luxury. Rest up in your Sealy posturepedic King bed after a day out shopping or working, enjoy complimentary in room Wi-Fi or movies on demand. The Superior King Rooms are located on the lower floors, offering a King Sealy posturepedic bed, 25 square metres of space, a 40” LED television, a large work desk, ergonomic business chair, tea and coffee-making facilities, movies on demand, complimentary Wi-Fi, a laptop-sized safe, minibar, pillow menu and complimentary bottled water. 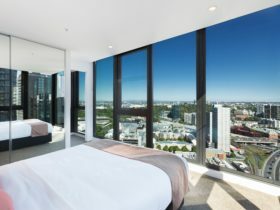 Wake up to beautiful views and finish your day watching the Melbourne skyline light up while draped in your cosy Radisson bathrobe drinking a coffee or a nice glass of wine. The Premium Park View rooms can provide you with this luxury. These stylish lower-level rooms offer you a Sealy posturepedic King bed, amongst other deluxe amenities: 25 square metres of space, a 40” LED television, a large work desk, ergonomic business chair, French press coffee, tea and coffee-making facilities, movies on demand, complimentary Wi-Fi, a laptop-sized safe, minibar, pillow menu, bathrobes and complimentary bottled water. Why settle for average when you can enjoy exceptional while travelling and that is exactly what the newly refurbished Deluxe Rooms will offer you. Experience the best of both worlds in one of our spacious King rooms. These limited rooms and exclusive amenities will ensure you feel the comforts of home. The Deluxe Rooms are located on the lower floors, offering a King Sealy posturepedic bed, 25 square metres of space, a 40” LED television, a large work desk, ergonomic business chair, espresso machine, tea and coffee-making facilities, movies on demand, complimentary Wi-Fi, a laptop-sized safe, minibar, pillow menu, bathrobes, slippers and complimentary bottled water. 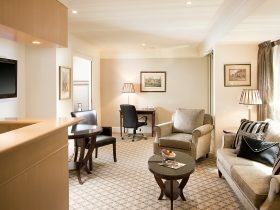 Experience the newly refurbished Deluxe Rooms along with beautiful views over Flagstaff Gardens. Experience the best of both worlds in one of our spacious Deluxe Parkview rooms. These limited parkview rooms and exclusive amenities will ensure you feel the comforts of home. The Deluxe Rooms offer a King Sealy posturepedic bed, 25 square metres of space, a 40” LED television, a large work desk, ergonomic business chair, espresso machine, tea and coffee-making facilities, movies on demand, complimentary Wi-Fi, a laptop-sized safe, minibar, pillow menu, bathrobes, slippers and complimentary bottled water. The Junior Suites provide you with all that you need to conduct business yet designed to make you feel like you are travelling for leisure. These contemporary Suites are located on the top floor. 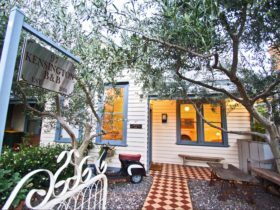 Showcasing a master bedroom and separate lounge area with butlers pantry where you can entertain friends or conduct business meetings. The junior suite offers a King Sealy posturepedic bed, 50 square metres of space, master bedroom and seperate lounge, bath with separate shower, butlers pantry, 40” LED television in bedroom, 42” LCD television in lounge, large work desk , an ergonomic business chair, espresso coffee machine and French press coffee, movies on demand, complimentary Wi-Fi, a laptop-sized safe, minibar, pillow menu, bathrobes and slippers, daily turndown service and complimentary bottled water. Amenities in all accommodation rooms include complimentary WiFi throughout the hotel. Complimentary bottled water daily, daily newspapers and fruit infused water in the lobby. Pillow menu, dry cleaning, laundry service and complimentary shirt pressing Monday to Thursday, 5:30 to 8:30pm.